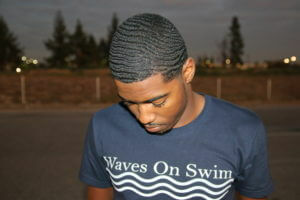 We here at 360 Wave Process know what it takes to have your waves on swim , so let’s talk about the first steps to obtaining the deepest waves by wolfing. Wolfing is abstaining from a haircut for an extended period of time. You need to understand that wolfing is the technique that will make your waves better than nearly every other guy you know with waves. Wolfing is not cutting your hair at all, no matter how much you may want to . This step is necessary for achieving waves, and teaching your hair the 360 Pattern. To truly wolf you need to put in some wolfing time. Wolfing Time is the amount of time you go without a haircut to allow your hair to grow and learn the impression of your desired wave pattern. Wolfing time can be determined by the amount time that has passed since your last haircut. The stages of wolfing can be a little difficult to understand as although you may be in the wolfing process, you are not truly wolfing until about four weeks after your last haircut. So now let’s talk about these different stages. Stage 0 starts immediately after your get a haircut. This is when you can begin to start counting your wolfing time. The first stage of wolfing is when your hair is at about a 1 length with the grain. An easy way to determine hair length is by looking at which guard you use. For example stage 0 is when your hair is at around a 0 guard length, stage one is when your hair is at about a 1 guard length and so on. CAVEAT: This length varies based on your hair texture. If your hair has a straighter texture you may have to wait longer before you actually start developing waves so your starting length may need to be different and longer than someone with a coarser texture. For the purposes of this informational we are focusing on a coarser texture, similar to that of Mr.360WaveProcess himself, Rashaad. If you are unaware of what texture we are talking about you can look at this video to get a better understanding. The second stage of wolfing is when you reach any where between 1.5 to 2 guard length with the grain. (Watch video below to see pictures of this stage). Stage Three Wolfing is About 3 Weeks after a fresh haircut. The third stage of wolfing is is anywhere between a 2 -3 guard length with the grain. And the fourth and final stage of wolfing is where it gets hard as your hair is growing out and you are in need of a haircut. As much as you want to cut it DON’T! At this point you can truly say you are wolfing. Stage Four Wolfing. About 4 weeks after a fresh haircut. Remember that It is essential to keep up with your brush work and laying down your hair when wolfing. 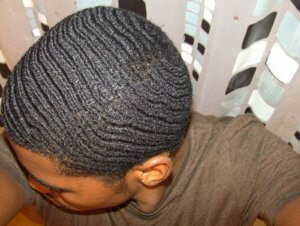 As new hair grows in you want to train it to follow the 360 wave pattern. This makes a difference in the definition of your waves and the distinction between controlled and uncontrolled wolfing. Uncontrolled wolfing is when you haven’t kept up with your brushing regimen and your hair isn’t laying down as much as you want it to, whereas controlled wolfing is when you keep with your brushing regimen and you can see definition in your waves. This ensures that when you go for your final haircut after the wolfing process you are ready to show the world your 360 waves! A fast and structured way to get your waves on swim is through interval wolfing. Interval wolfing is when you increasingly extend the time between haircuts. You begin by waiting until the point you think you need a haircut and then extending that wait another 2 weeks.Once you get your haircut you wait for it to grow out again and then instead of waiting 2 weeks again, this time you now wait 4 weeks, steadily increasing your wolfing time by 2 weeks in between haircuts until you reach the 12 week mark. The intervals go as such when waiting between haircuts, 2 weeks, 4 weeks, 6 weeks, 8 weeks,10 weeks, 12 weeks. 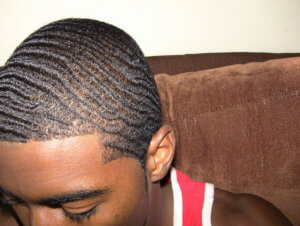 At that point, when you get a haircut, your waves should be fully on swim and you are now a 360 waver! (content written by Dyanna G. information sourced from 3WP video above). ‹ How to get 360 Waves Fast – 4 Tips For Quicker Results! can white people or italians like me do that to my hair ? What exact grease, combs, brushes, and shampoo/conditioner do I need. how low do you cut your hair when you have done wolfing?